1. Set aside time either at the beginning or end of each day when you won't be interrupted, and go through each e-mail one by one, keeping in mind that you can either: save, archive, delete, and/or forward. 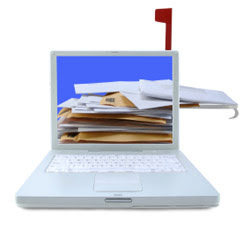 In terms of archiving, most e-mail programs have label programs you can use so you can make categories, much like paper folders. These come in handy for reference items that may not be urgent, but that you want to come back to, like confirmations for online purchases, reservations, etc., frequent flier statements, e-newsletters you like, etc. 2. Don't be afraid to delete! When you get to an item, ask yourself: do I really need to read through this? Or, will I get to or need it in the next six months? If it's not worth spending the minute or two on, don't. 3. Be choosy about e-news subscriptions. I recently unsubscribed to a newsletter that I really thought would be useful. Instead, the writer only promoted their new book throughout the entire e-news, and included the same article each time! If the content isn't good, "use it or lose it," so to speak. 4. Mark items of high importance or ACTION items. Google has a feature where you can mark important items with a gold star. I find this very useful during a busy day, when I don't want to lose track of key items but can't get to them until later. At the end of the day I go through all the gold stars and that way I haven't missed anything. 5. Keep videos under control. If you get blogs in your in box, you will notice that many bloggers have turned into "vloggers," using video instead of text. Also, more and more people are e-mailing video attachments or testimonials, or links to web pages with the same. This can be time consuming. If the video is more then 1-2 minutes, I keep it in a separate folder to return to later and review all at once. 6. Limit your news sources. Once, I realized I had gotten the day's news from about 10 different sources! While it was interesting from a journalistic point of view, no one has the time each day to read through that many links. I chose 1-2 sources that I like the most, and deleted the rest. A quick note on outgoing e-mails...do you ever feel like your messages are lost in cyberspace? Ever e-mail someone and they get back to you 6 weeks or 6 months later, saying they only just got it? If it's something urgent, make sure you follow up with a phone call, and that way the other party has no excuse and you've covered yourself. Got tips for managing your e-mail? Send them in and I may include them in an upcoming issue of my e-newsletter! Also, I recently discovered a cool blog called zen habits, and found a good entry regarding keeping your in-box completely empty and other mind clarifying entries. This link is to the home page but you can search a number of topics.